(Tech Xplore)—Intel's superfast Optane drives could soon be coming to Apple MacBooks, according to reports. This may represent a new class of memory and storage technology. Optane products would be in the form of SSDs and traditional Dimms, say reports, expected to be released this year. Optane is the name accorded for a type of memory and SSD based on 3D XPoint—it's a line of memory and storage which utilizes 3D XPoint, developed jointly by Intel and Micron. Intel positions its 3D XPoint as a major breakthrough in memory process technology. 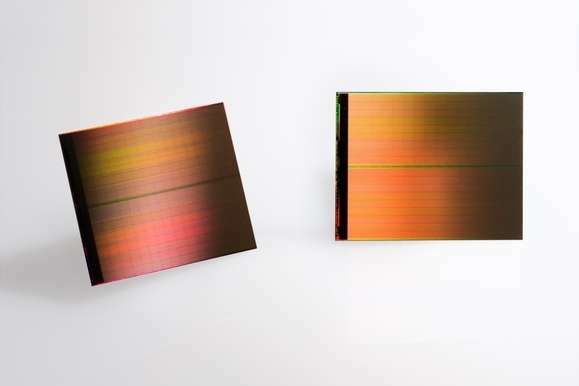 3D XPoint technology was unveiled by Intel and Micron last year. Its significance for storage memory has been highlighted. "One of the most significant hurdles in modern computing is the time it takes the processor to reach data on long-term storage," said Mark Adams, president of Micron. "This new class of non-volatile memory is a revolutionary technology that allows for quick access to enormous data sets and enables entirely new applications." The reason for its name 3D XPoint becomes clear in the company's description of its transistor-less "cross point architecture," which creates a three-dimensional checkerboard: memory cells sit at the intersection of word lines and bit lines, allowing the cells to be addressed individually. Data can be written and read in small sizes; this leads to faster, more efficient read/write processes. The 3D XPoint technology is up to 1,000 times faster and has up to 1,000 times greater endurance than NAND, and is 10 times denser than conventional memory, said Intel. The 2015 announcement at the time said it was "now in production." Agam Shah of IDG News Service this month said the 3D XPoint technology was "soon-to-be-released." Shah reported that "Intel's been quiet about its super-fast Optane memory and SSD products, but a few emerging details may hint at how they could be used in products like Apple's MacBooks." Ben Lovejoy in 9to5Mac pointed out that "Apple's PCIe SSDs are already very fast, in part due to the Non-Volatile Memory Express (NVMe) protocol used in the latest MacBooks." Why are all eyes on Apple among the laptop vendors? Shah said that "Apple is among the first vendors to implement the latest laptop technologies and may jump at the chance at putting Optane in its MacBooks." Also, Shah reported that "Optane's compatibility with NVMe was revealed during a session focused on Lightning, an open-source storage design, at the OCP U.S. Summit in San Jose, California. Lightning, developed by Intel and Facebook, provides flexible storage in which capacity can be cranked up depending on processing needs." According to Shah, the first Optane products will likely be SSDs and reach enthusiasts' PCs next year, then spreading to other desktops and mobile products. Also coming are Optane memory DIMMs, which can be plugged into existing memory slots.